The Minnesota Twins may be adding an x-factor for their late-season playoff push. The Twins activated left-handed reliever Glen Perkins on Thursday. It’s been more than 16 months since his last big league appearance following a long journey back from shoulder trouble. Perkins will be active for Minnesota’s double-header against the Indians on Thursday. He hopes to give the Twins a lift down the stretch. Before the shoulder trouble, Perkins served as Minnesota’s closer from 2012 to 2015. He made three all-star appearances during that time and was one of the most reliable relievers in baseball. However, Perkins made just two appearances in April of 2016 before damage to his labrum and rotator cuff forced him to have season-ending surgery. 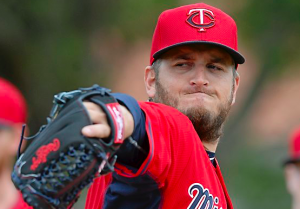 After a long rehab and multiple setbacks, he’s finally ready to rejoin the Twins. In preparation for his return, Perkins made eight minor league rehab appearances. However, those came with mixed results. He struck out 10 batters over 7.1 innings. But he also posted a 6.14 ERA and 1.50 WHIP. Those numbers leave some doubt as to whether Perkins can still be an effective big league pitcher. But Perkins insists he’s ready. Perkins rejoins the Twins at an interesting point in the season. A month ago, Minnesota believed it was a contender and acquired starter Jaime Garcia to provide a boost to the pitching staff. But a losing skid right before the trade deadline turned them into sellers. They flipped Garcia to the Yankees and traded closer Brandon Kintzier to the Nationals. However, the Twins have won seven of their last nine heading into Thursday, putting them just a game out of the second wild-card spot. With Kintzier being traded before the deadline, Minnesota’s bullpen is in a state of flux. Twins manager Paul Molitor does not have a full-time closer at the moment. Perkins could be considered a candidate, but not after a 16-month hiatus. There’s also some uncertainty about what Perkins has left in the tank after so much time away. It’s unlikely that he’ll have the same kind of velocity he had before shoulder surgery. Recent reports have his fastball just barely hitting 90 mph. Even if he doesn’t have the same stuff as before or pitch in a lot of high-leverage situations, simply getting Perkins back can provide a lift for a bullpen that’s ranked near the bottom in the American League in ERA this season.